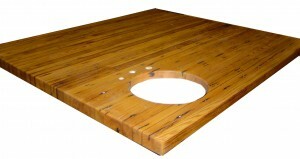 Custom Cutting Boards are indispensable in kitchens today. They can be mobile or in a permanent location that is easy to access. Cutting boards can be crafted in Edge Grain Construction or End Grain Construction. Below is a Peruvian Walnut Edge Grain Cutting Board designed by Griffey Remodeling. This cutting board was placed strategically close to the stove top and the sink, making it easy to access for food preparation purposes.This cutting board is 5 inches thick and includes a 1/8″ Roundover Edge Profile on Top, Bottom and Vertical corners of all edges. 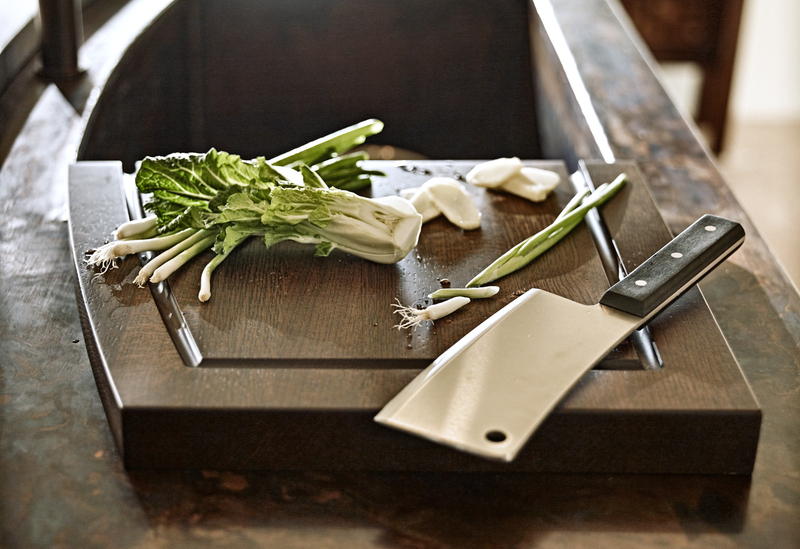 We highly recommend choosing a cutting board crafted in end grain construction. End grain is generally ten times harder than edge grain. 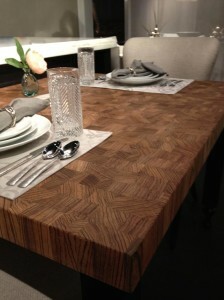 End grain is ideal for applications where looks and functionality are important. Knives keep their edge far better when used on end grain cutting boards because the blade slides between the wood fibers much like cutting into a firm brush. An added benefit is that end grain does not show knife marks quite as readily as edge grain. Pictured below is a custom Random Mix Sapele Mahogany End Grain Cutting Board designed by Past Basket Design. The cutting board is 7 1/4 inches thick with a 1/8″ Roundover Edge Profile on top horizontal edge, bottom horizontal edge, and vertical corners. Cutting boards are not limited to features and options. A cutting board can include any of our edge profiles. Cutting boards can also include laser engraving. This feature allows you to truly customize your designs. Many clients have used Laser Engraved Cutting Boards as gifts. Anything can be engraved – from images to logos, even designs. The possibilities are endless. 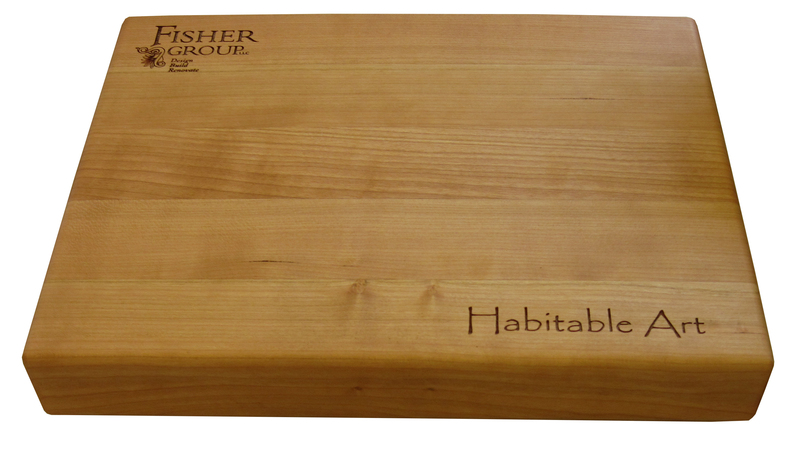 Below is a cutting board Fisher Group designed with the company logo in the upper left hand corner and ‘Habitable Art’ in the lower right hand corner. Cutting boards can also include a waste or trash hole. The food scraps are quickly swiped into the hole for efficient food preparation. The holes can be crafted with a custom lid if desired. 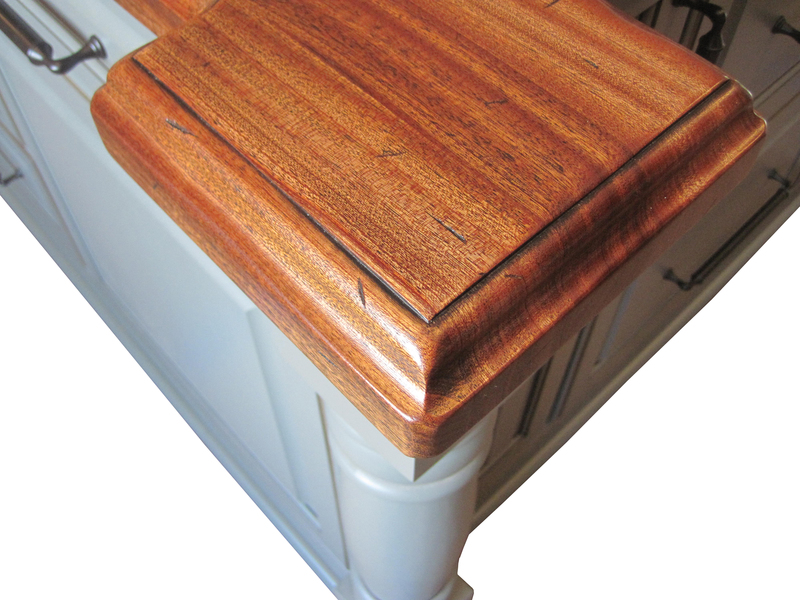 Grothouse offers custom made steel lids as pictured or flush mount lids with flip up handles. We can also craft a lid of wood if you desire. The size and shape of the hole can vary based on your intended use. This element of customization can add a decorative flair to your well-organized work space. Custom Cutting Boards by Grothouse are always finished with Grothouse Original Oil™ to ensure a food safe, nut-allergy-free surface ready for food preparation. To view more cutting boards and for design inspiration, visit our Countertop Image Library. Wood Bar Tops by Grothouse can be crafted for Commercial and Residential use. 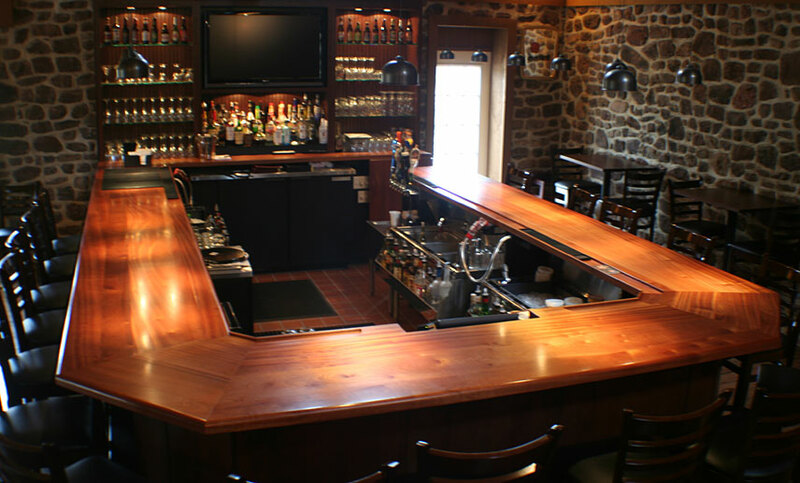 Bar Tops can be constructed in any configuration: construction style, wood species, edge profiles, shape, or size. 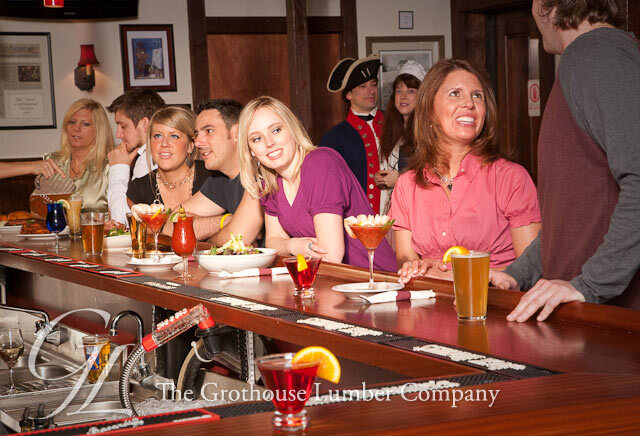 Grothouse offers two distinct bar molding styles. 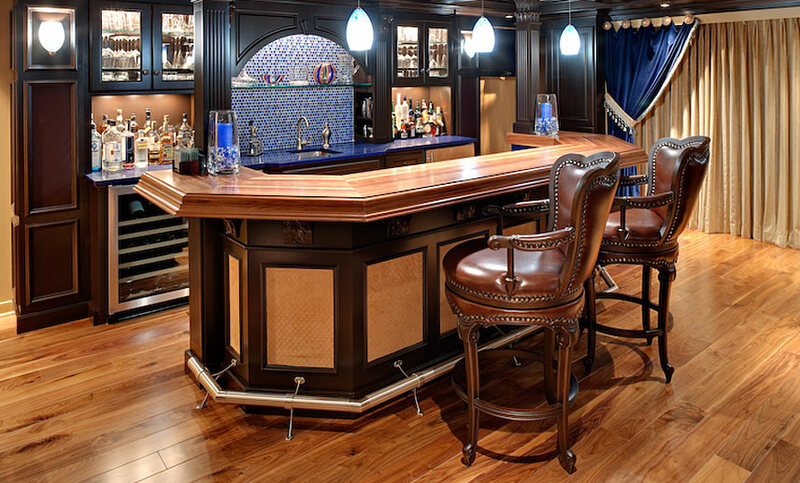 The bar molding style you choose should take cues from the design of the space. 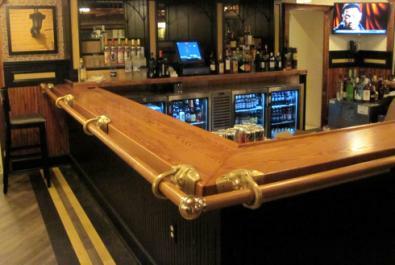 Traditional bars have Chicago Bar Rail, designed to provide a place for guests to rest their arms. Chicago Bar Rail also helps avoid spilled drinks from falling into guests laps or onto the floor. 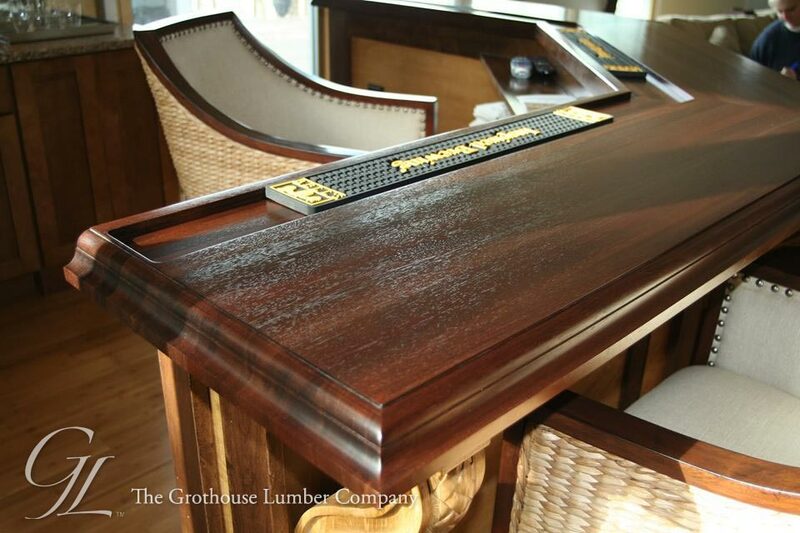 Grothouse crafts the Chicago Bar Rail of the same wood specie as the bar surface to ensure a uniform look. The Bar Top shown below includes a Chicago Bar Rail. This bar was designed by Ruth Schoeneberger of Morris Black. The other molding style available at Grothouse is the Synthesis™ Bar Rail. Synthesis™ Bar Rail is a Chicago style bar rail that is carved into the bar surface on site with the same wood species lot as the bar top. 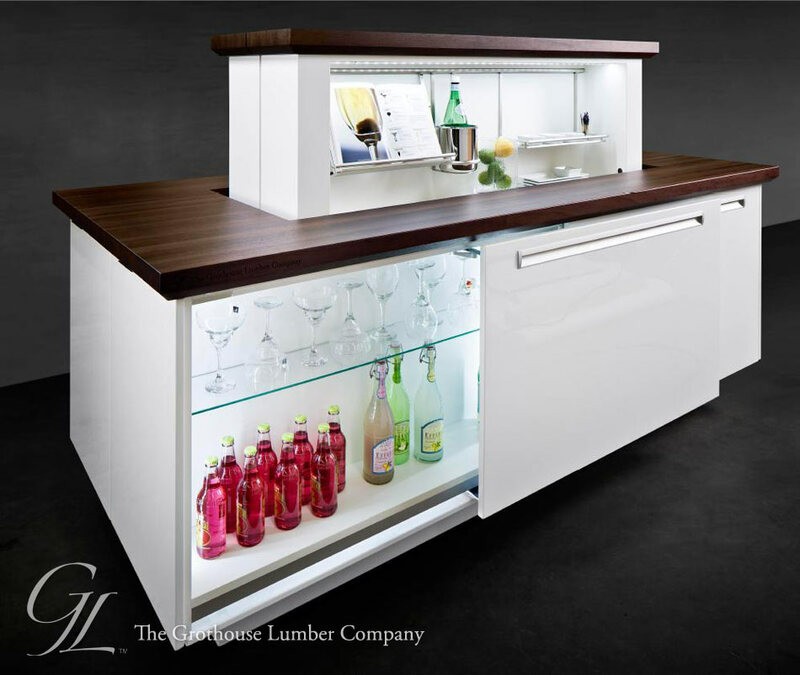 Commercial Wood Bar Tops provide professional clients with the highest quality wood surfaces in the industry. 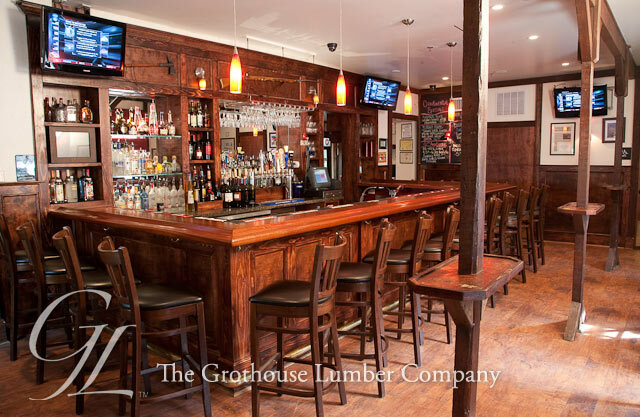 Grothouse crafts the bar to meet your objective of a stunning warm design with an efficient use of space for servers and consumers. Each bar top is crafted to the clients’ custom design, including all cut outs, features and shapes. Grothouse bars always arrive ready to install. 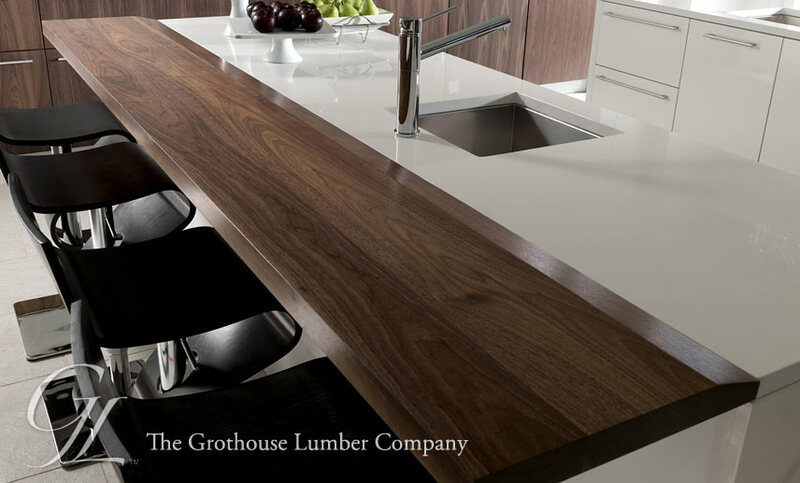 Grothouse is the exclusive provider of Durata® Waterproof wood countertop finish. 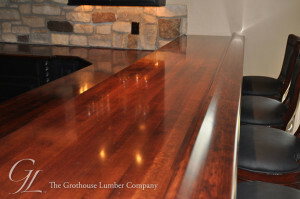 This commercial grade finish has been used for years in commercial bars, restaurants and country clubs throughout the United States. Durata® Finish is waterproof, so spilled drinks and stains are no longer a worry. The finish is permanent and does not require reapplication, which allows you to stay open for business with no shut downs necessary. Durata® is designed so it does not flake or yellow like polyurethane finishes and is more chemically resistant than Spar Varnishes. Durata® is available applied on wood bar tops crafted by Grothouse and is not sold as a stand-alone product. Pictured above is The New Continental Tavern in Pennsylvania. The Wood Bar is crafted of Sapele Mahogany in Flat Grain Construction. The bar includes Chicago Bar Rail and is sealed with Durata® Finish. Bar Tops are popular in basements of residential homes. Wood Bars are a warm and inviting area to entertain friends and family. 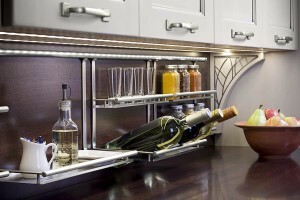 The residential bar pictured below was designed by PJ Stofanak Inc with luxury in mind. 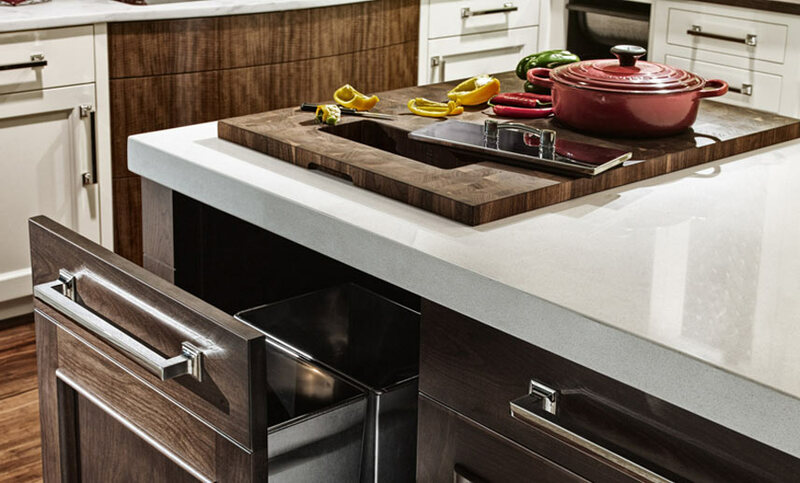 The Walnut Bar Top is finished with Durata® wood countertop finish. The overall bar design is very pleasing to the eye. A closer look will discover a bright blue countertop on the back bar that includes glass cabinetry doors for glass storage and a center glass shelf for displaying treasured pieces. The back bar has beautiful tile to accent the brown tones that dominate the design. Under counter wine fridge keeps cold bottles handy and a bar sinks makes clean up a breeze. The drapery protects the large screen television when not in use. This bar is an entertainers dream and the attention to detail speaks to the talented designers that created the space. Opportunities are limitless for Commercial and Residential Grothouse Wood Bar Tops. You can view more photography of bars in our Photo Gallery. Grothouse Distressed Wood Countertops are the perfect component for those trying to achieve a rustic, old-world feel in their home. All Grothouse wood surfaces can be distressed to evoke the appearance of a truly original antique. 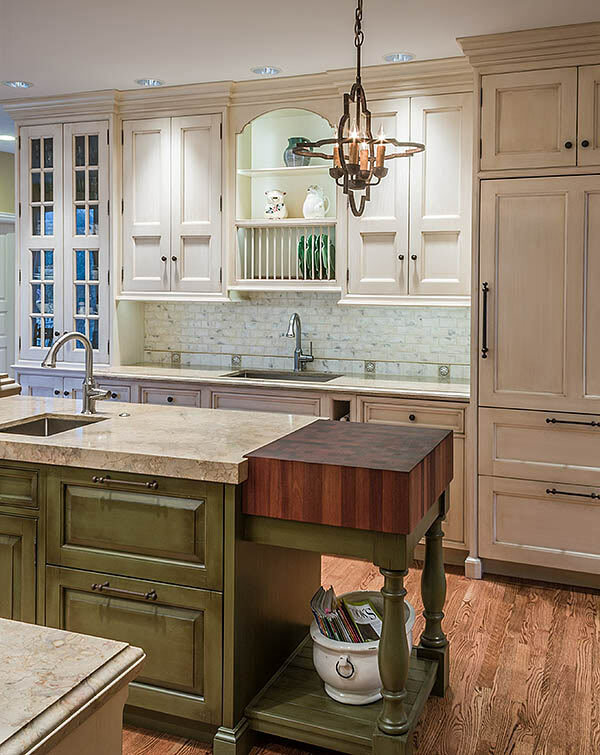 The deliberate process of crafting Distressed Wood Countertops is carefully executed to mimic the hard use or elemental wear that is seen over time. Distressing can be done to the top, side, and bottom edges of the countertop. The process of distressing is done very carefully to assure that the wear does not look “purposeful” or “factory made”. Grothouse offers distressing in several different levels: four basic levels and one super distressed level. To confirm the correct level of distressing, Grothouse will require approval of a distressed sample prior to production. Distressing Level 1: Lightly worn corners and edges; light dings. The Walnut wood counter pictured below is distressed to Level #1 on the top of the surface. The edges are distressed to Level #3. A hand rubbed Black Glaze has been applied to the counter and is sealed with Durata® Finish in Satin. Distressing Level 2: Moderate worn corners and edges; moderate dings and light drag marks. The distressed wood countertop below was crafted for the This Old House® Auburndale Project in 2011. This Sapele Mahogany wood countertop was distressed to Level #2 with hand rubbed Black Glaze and sealed with Durata® Finish in Satin. Distressing Level 4: Very heavily and unevenly worn corners and edges; plentiful dings; clusters of worm holes; plentiful drag marks and termite tracks. Below is a Beech Wood Vanity that was distressed to Level 4 with a hand rubbed Black Glaze (Margamo – #04715). This vanity was finished with Durata® Finish in Satin. The Sapele Mahogany wood countertop pictured below is super distressed. 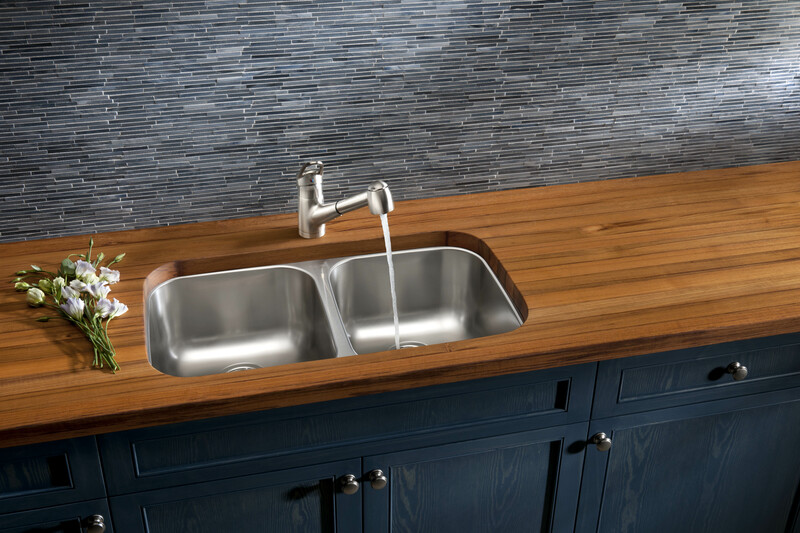 Distressed Wood Countertops are typically finished with our waterproof, permanent Durata® Finish. This finish is offered in available in Satin, Matte or Semi-Gloss sheen. This is a maintenance free finish, but you cannot chop directly on this finish. Glaze and stain can be added to accentuate the distressing. Distressed Wood Countertops are typically hand rubbed with Black Glaze. Any wood countertop with glaze or stain must be sealed with our Durata® Finish. 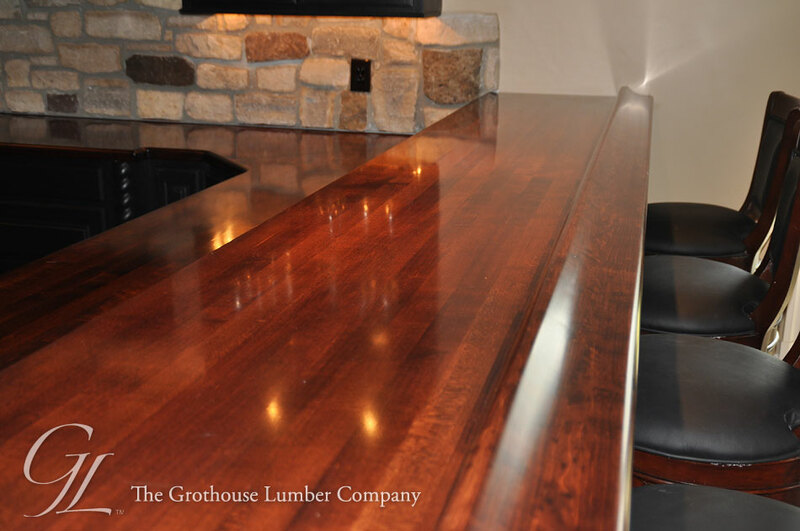 Distressed Wood Countertops can also be finished with Grothouse Original Oil™. Grothouse Oil is a pure mineral oil used for lasting protection on wood surfaces. Grothouse Original Oil™ Finish is completely food safe and can be used on food preparation surfaces. This finish requires ongoing maintenance. You can view more Distressed Wood Countertops in the Grothouse Countertop Image Library. Peruvian Walnut Countertops are used for many different countertop surfaces, including bar tops, kitchen islands, and tables for commercial and residential use. Woodwork Specialties Co. designed the Peruvian Walnut Wood Bar Top pictured below. This Wood Bar Top includes a Drink Rail. 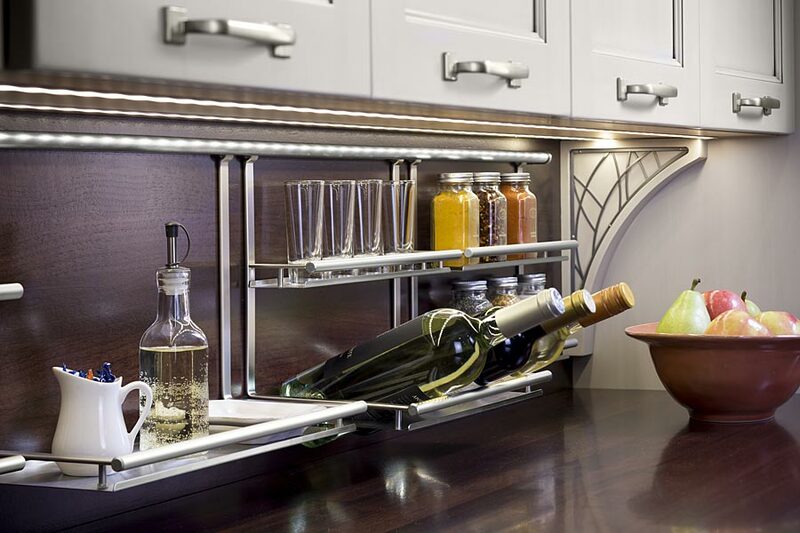 Drink Rails are used to protect the rear of the wood bar countertop from spills. They also provides a suitable space to set glasses and other materials. Peruvian Walnut Bar Top designed by Woodwork Specialties Co.
Peruvian Walnut Countertops are commonly used for kitchen islands. 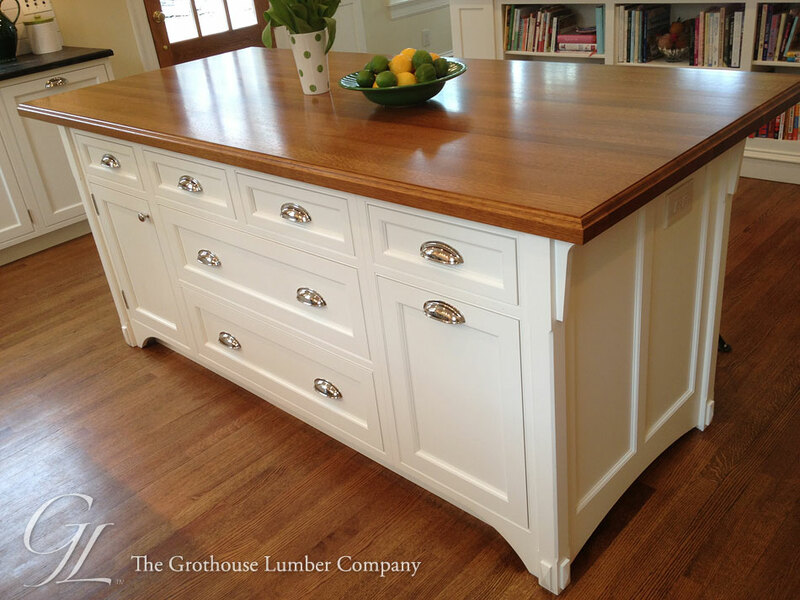 One of the largest countertops ever made by Grothouse is pictured below, designed by Chervin Woodworks. This top is 2-3/4″ thick x 5 feet wide x 18 feet long. This top was shipped safely from Pennsylvania to Ontario. It weighed about 1,300 pounds. 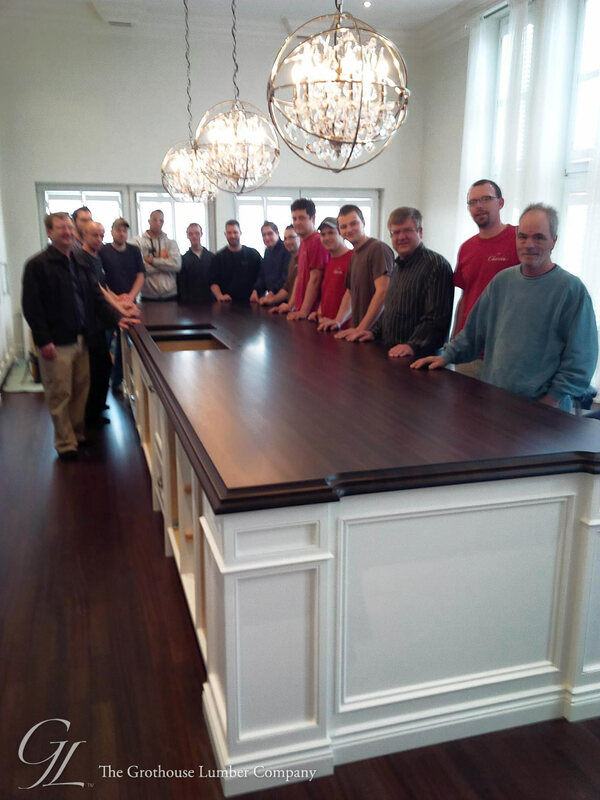 It took every man in the photo to carry the Peruvian Walnut Wood Countertop into the home. Peruvian Walnut Wood Countertops are used as the entire kitchen island top, but they can also be used as part of the kitchen island. The Peruvian Walnut Countertop seen below is used as a seating and dining area attached to the kitchen island. This modern kitchen was designed by Exquisite Kitchen Design. The kitchen island seen below was a collaboration with Rutt Custom Cabinetry and Hafele. It includes Hafele’s Frontino Sliding Door Hardware, LED Lighting, Mechanical Lifts, Decorative Hardware and more. The center of the island raises to reveal space for appliances and computers. 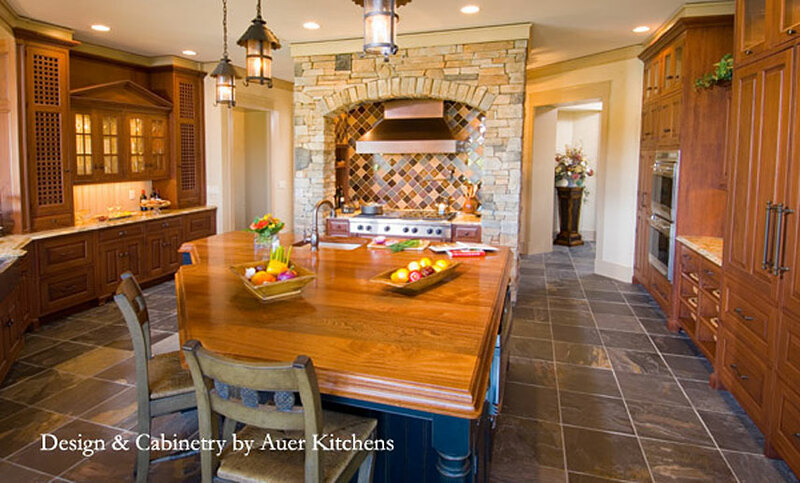 The Peruvian Walnut Countertops were designed by Jason Artus of Rutt Custom Cabinetry Group. Peruvian Walnut Wood Countertops can also take form as a Parsons Table. The Peruvian Walnut Parsons Table shown in the picture below was designed by Venegas and Company for this transitional kitchen. 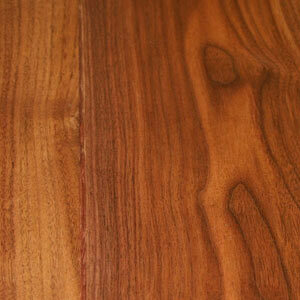 Peruvian Walnut is also known as Tropical Walnut or South American Walnut. It originates from Central and South America. 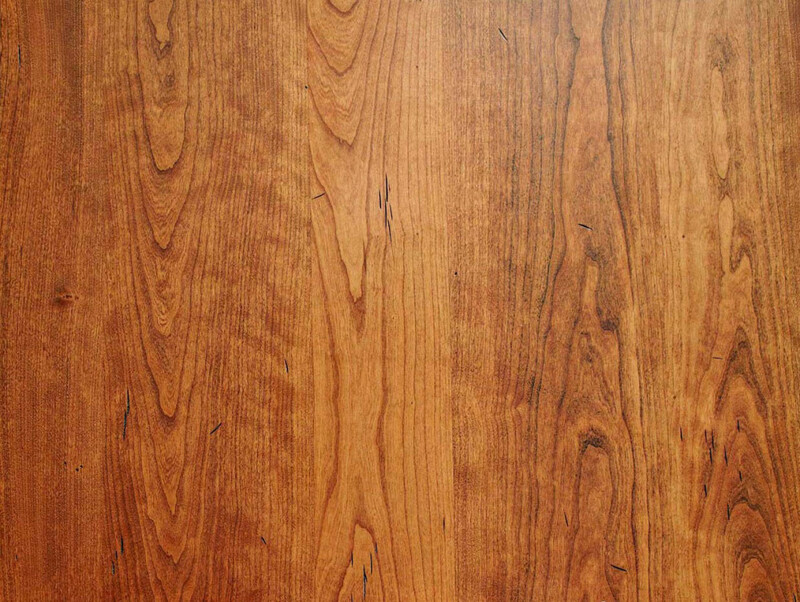 Peruvian Walnut can also be used for cabinetry, musical instruments, trimming, and flooring. See what customers have to say about their Peruvian Walnut Countertops on the Wood Countertops Reviews page. 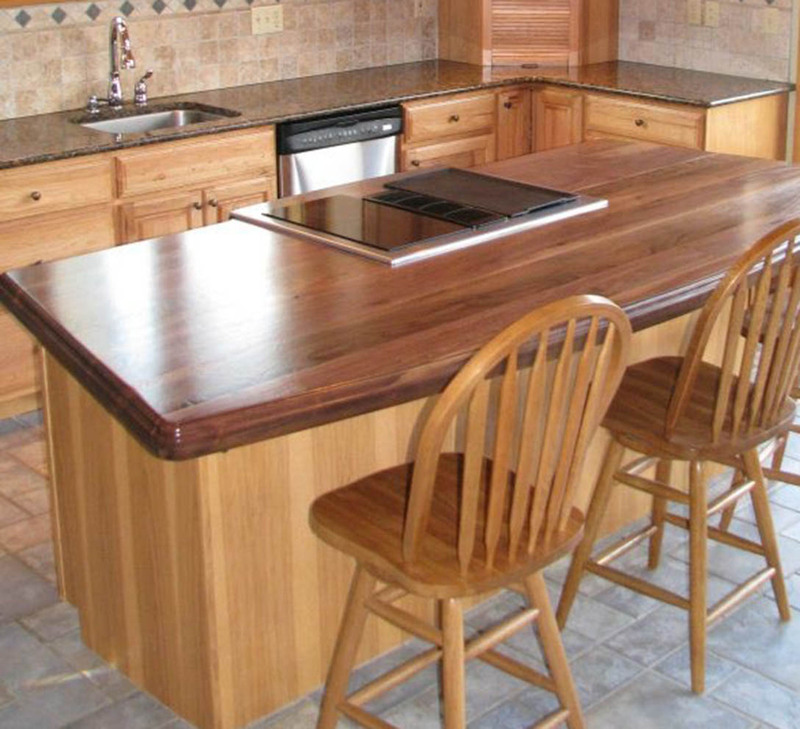 Sapele Mahogany Wood Countertops are extremely popular for wood bar tops and kitchen countertops. 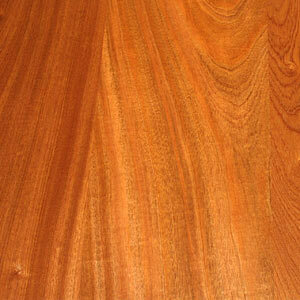 Sapele Mahogany is a commercially important wood and is the primary replacement for Genuine Mahogany. Sapele Mahogany Countertops are the center of attention in every room and can be brought to an excellent finish. Sapele Mahogany has a Janka Hardness Scale of 1510. Sapele Mahogany Countertops can be made in three construction styles: Flat Grain Construction (also known as Wide Plank), Edge Grain Construction, and End Grain Construction (also known as Butcher Block). Sapele Mahogany Countertops are commonly distressed with a hand rubbed glaze and our Durata Finish, as shown in the picture below. 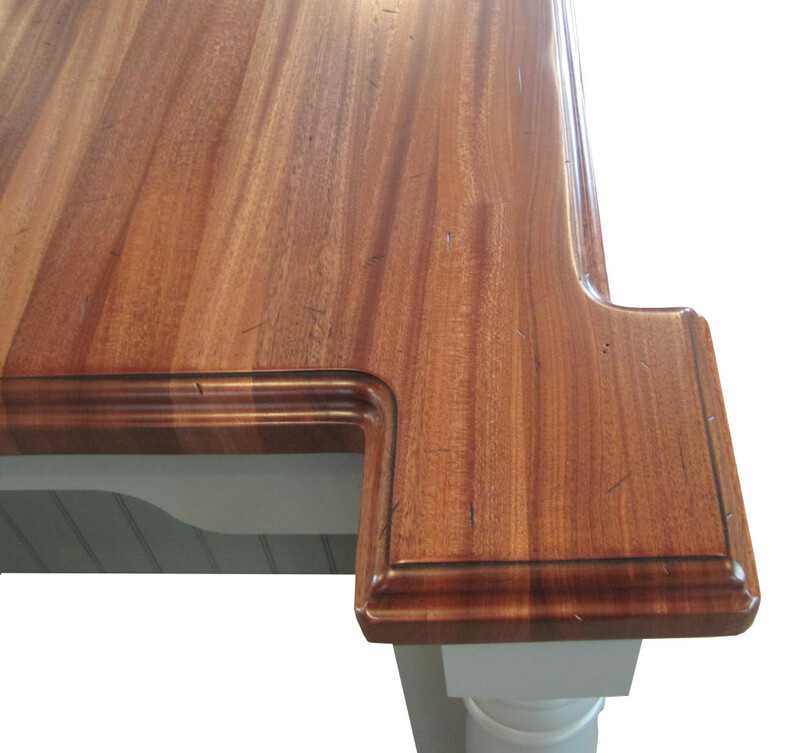 Sapele Mahogany Wood Countertops are extremely popular in today’s kitchens. They are commonly used as kitchen island ends, on either one side or both sides of the island. Pictured below is a Sapele Mahogany Butcher Block Kitchen Island End designed by Past Basket Design. 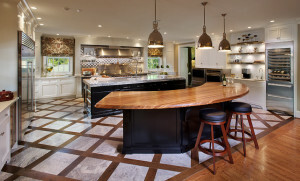 The use of the Butcher Block on the kitchen island end serves as a food preparation surface. Sapele Mahogany Countertops can also be used on kitchen island ends for use as extra counter space. Pictured below is a Sapele Mahogany Flat Grain Wood Counter designed by Echelon Custom Homes that is used as a kitchen island end for more counter space. Sapele Mahogany Wood Countertops can also be used for a kitchen island table. A kitchen island table doubles as a kitchen island, but can also be used for a dining and seating area. This is shown in the picture below designed by Auer Kitchens. As stated previously, Sapele Mahogany is a commercially important wood. It is often used for commercial bar tops. 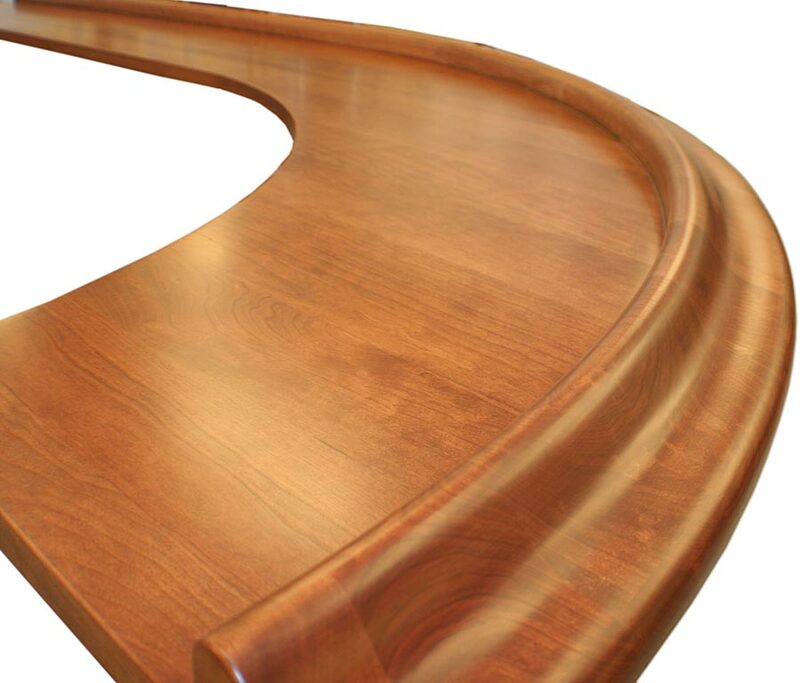 Wellsford Cabinetry, Inc. designed the U-Shaped Sapele Mahogany Bar Top shown below. Sapele Mahogany Commercial Wood Bar Top designed by Wellsford Cabinetry, Inc.
Sapele Mahogany is typically used for furniture and cabinet making. It originates from Africa. The tree typically grows to be about 150 feet high (45 meters). Cadillac used Sapele wood for their interior wood trim on their vehicles. Sapele Mahogany is available FSC certified. 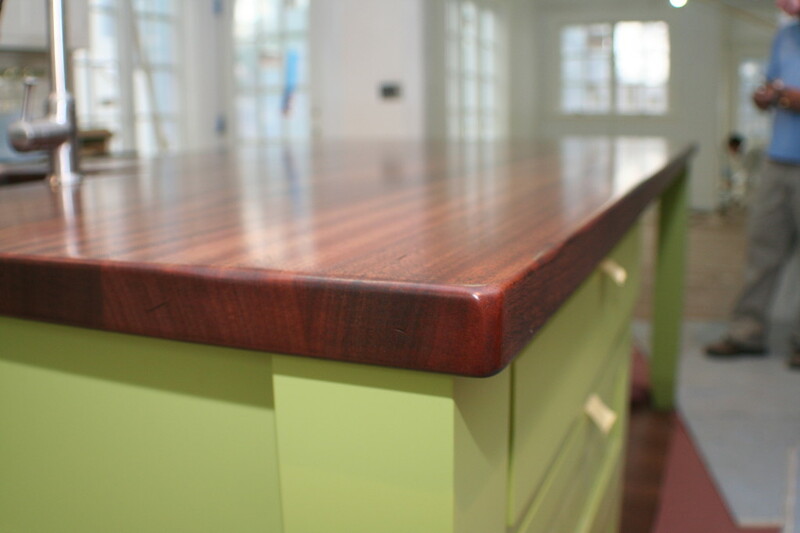 See what customers have to say about their Sapele Mahogany Countertops. White Oak is one of the superior hardwoods of eastern North America. It has an exceptional resistance to wear, making White Oak Countertops exceptional for use in kitchens, bathrooms, and offices. White oak has long modular rays. This gives it a strong quartersawn figure, for which it is highly renowned. White Oak has a Janka Hardness Scale of 1360. White Oak Countertops can be made in three construction styles: Flat Grain Construction (also known as Wide Plank), Edge Grain Construction, and End Grain Construction (also known as Butcher Block). No matter the construction style, white oak wood countertops have the ability to look great in any kitchen or bathroom, from traditional style to modern style. White Oak stains and polishes well. Pictured below is a White Oak Countertop with a Custom Stain Match designed by Main Street Cabinet Co, LLC. It is edge grain construction. This countertop is used for a kitchen island. It is paired with white cabinetry and has a traditional style. Due to the lighter colors of White Oak Countertops, they can be altered to look great with various colors of cabinetry. Pictured below is a White Oak Countertop designed by Kitchen and Bath Concepts of Pittsburgh. It is edge grain construction. This countertop is paired with blue/grey cabinetry and has a fusion style. It is stained to be a darker brown. The White Oak Countertop compliments the copper counters. This kitchen is a fantastic example of pairing wood with another countertop surface. 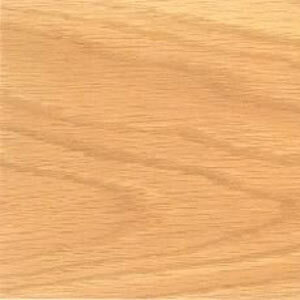 White Oak is also known as Arizona Oak, Stave Oak, and American White Oak. It originated in North America. White Oak trees can live to be 600 years old and typically grow to be about 80 to 100 feet high. White Oak wood is water resistant and rot resistant due to its closed cellular structure. The wood can be used for barrels in the wine and whiskey industries because it resists leaking. 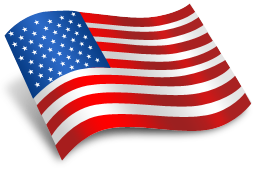 It can also be used for boat building, flooring, paneling, coffins, shingles, railroad ties, plywood, trim, and joinery. 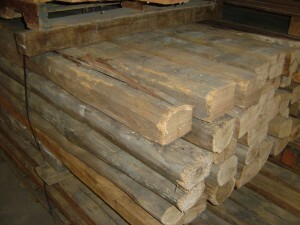 FSC White Oak lumber is available. 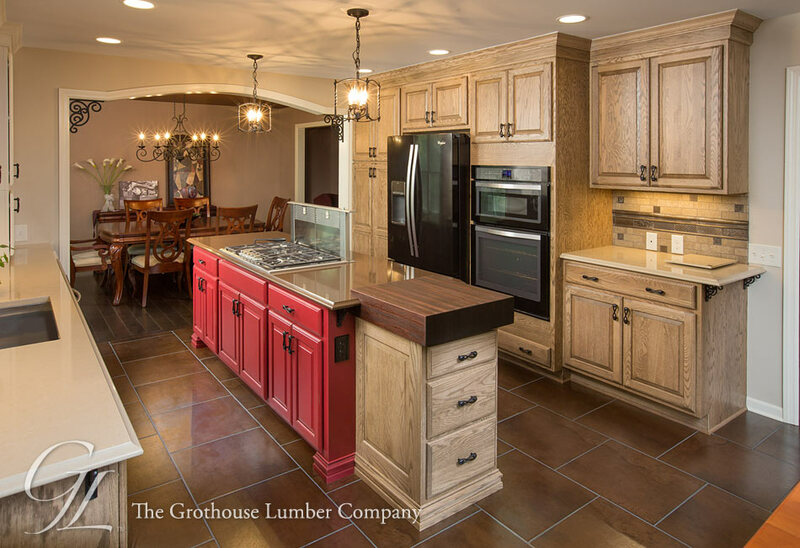 Established in 1994, the Grothouse Lumber Company is the most technically advanced and creative manufacturers in the wood surfaces market. Our custom-built wood countertops can be configured with a myriad of available options, including 60+ wood species, and 30 edge profiles. Our specially-formulated Durata; permanent finish is one of the most durable and reliable protective coatings currently available on the market today. 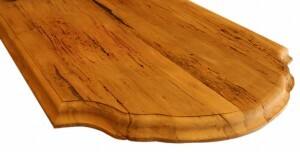 Visit our webpage http://www.glumber.com to learn more about our White Oak Wood Countertops. 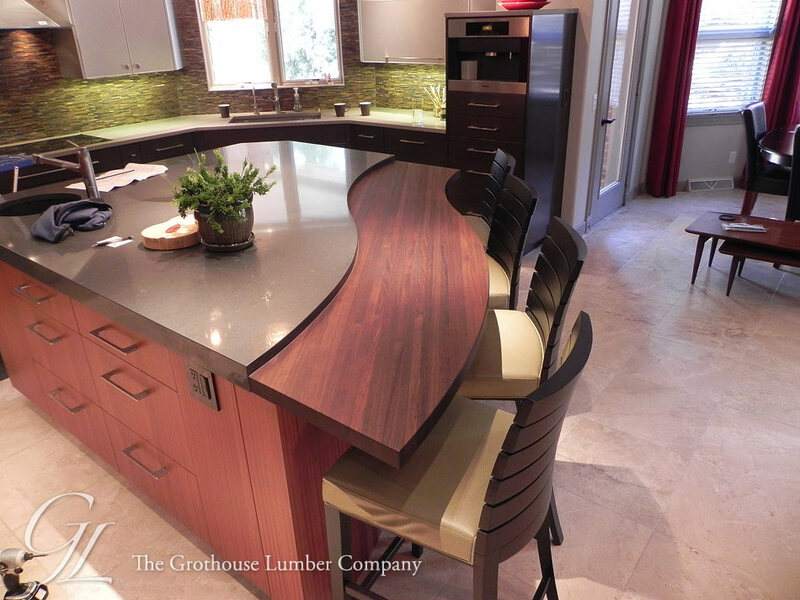 Walnut Countertops are one of the most popular countertops manufactured by Grothouse. Walnut is a prized cabinetmaking wood. This is because Walnut is noted for its beautiful grain, which is slightly open and straight. It can also exhibit a wavy or curly figure. Walnut Countertops can be made in Flat Grain Construction (also known as Wide Plank), Edge Grain Construction, and End Grain Construction (also known as Butcher Block). Walnut Countertops can be crafted to match any style room, whether it be traditional or modern. Walnut is a great wood for making countertops because it is hard and tough which gives it moderate crushing and bending strength, as well as medium stiffness. The janka scale for Walnut is 1010. Pictured above is a Walnut Counter made in Flat Grain Construction. This kitchen design demonstrates how wood can be used effectively in Modern Kitchens. The Walnut Counter adds warmth to the room. 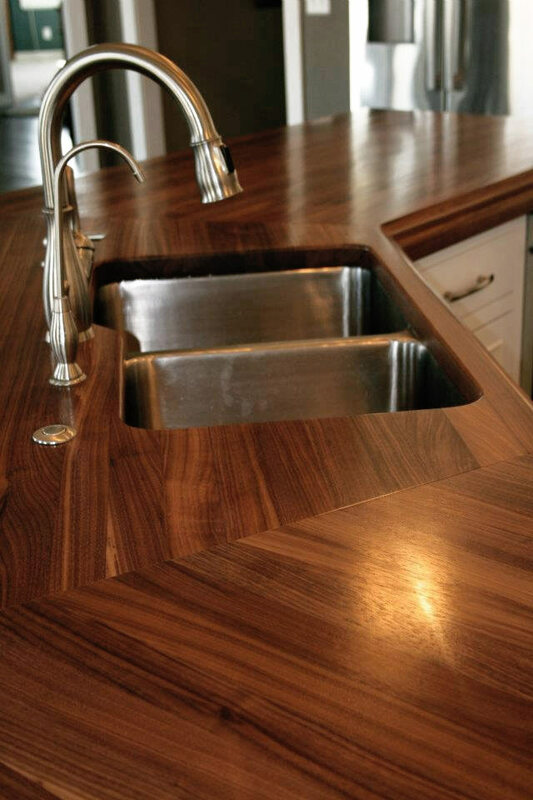 The Walnut Countertop pictured above was manufactured in Edge Grain construction. This countertop contains an undermount sink. The grain figure in the Walnut is shown beautifully throughout the countertop. The brown colors in the Walnut are complimented by white cabinetry. Walnut originates from North America. 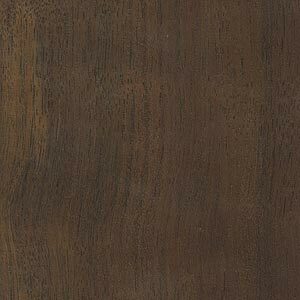 It is also known as Black walnut, American Walnut, Eastern Black Walnut, Gunwood, and Virginia Walnut. The heartwood of Walnut is brown and the sapwood is beige or Maple colored. What Kind of Backsplash goes with Wood Countertops? One of the best characteristics about wood countertops is that they can be designed to look fantastic in any style kitchen, bathroom, office – you name it. This being said, wood countertops can be designed to look fantastic with any backsplash desired! Wood Countertops are commonly paired with a tiled backsplash. 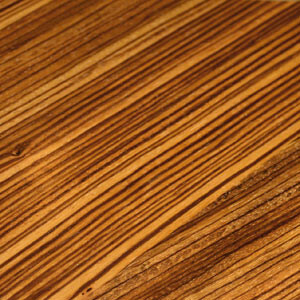 Pictured below is a Burmese Teak Wood Countertop designed by Blanco. This wood countertop is paired with Satchmo Sticks BB Blue GJGSSBBB, Artistic Tile Backsplash. 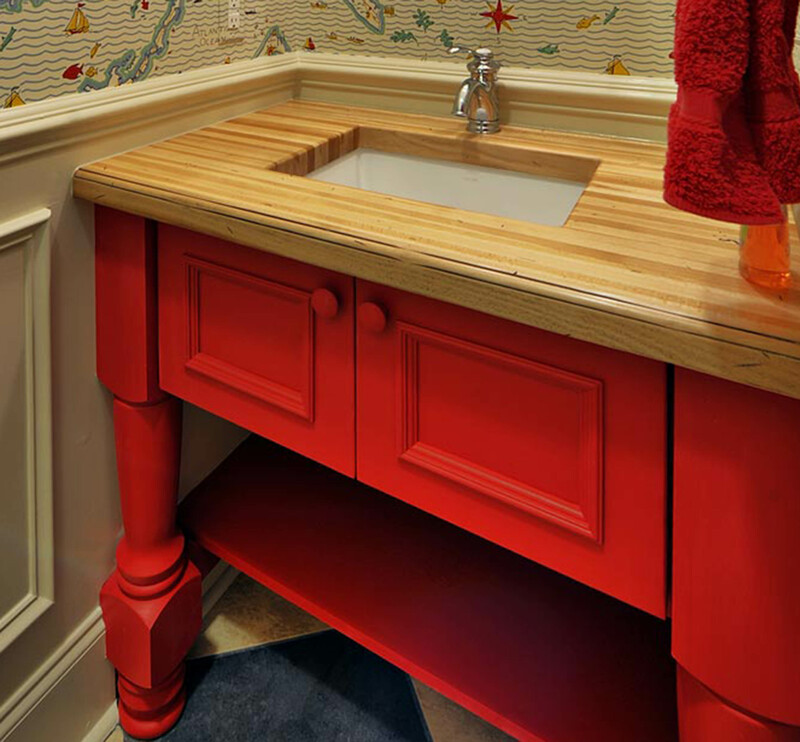 The colors of the wood countertop add warmth to this design. The sink pictured is a Blanco Niagara Double Bowl #440160 with a Blanco Meridian 1.8 Semi-Pro Faucet#440558. Another example of a Wood Countertop paired with a tile backsplash is this beautiful kitchen designed by House Captains, Inc. in Florida. 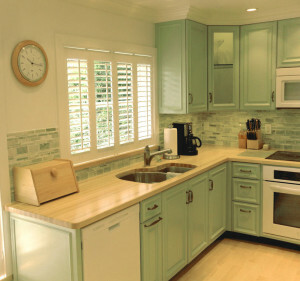 The Maple Wood Countertops compliment the teal colored tile, as well as the teal cabinetry. Wood Countertops don’t have to be limited to a tile backsplash. Stone is used as the backsplash for this Maple Wood Bar Top designed by A Designer’s Touch in Maryland. The two natural elements paired together create an astounding design. What kind of backsplash goes with Wood Countertops? How about a Wood Backsplash! Mary Jo Peterson designed this Walnut Wood Countertop to include a Walnut Wood Backsplash. 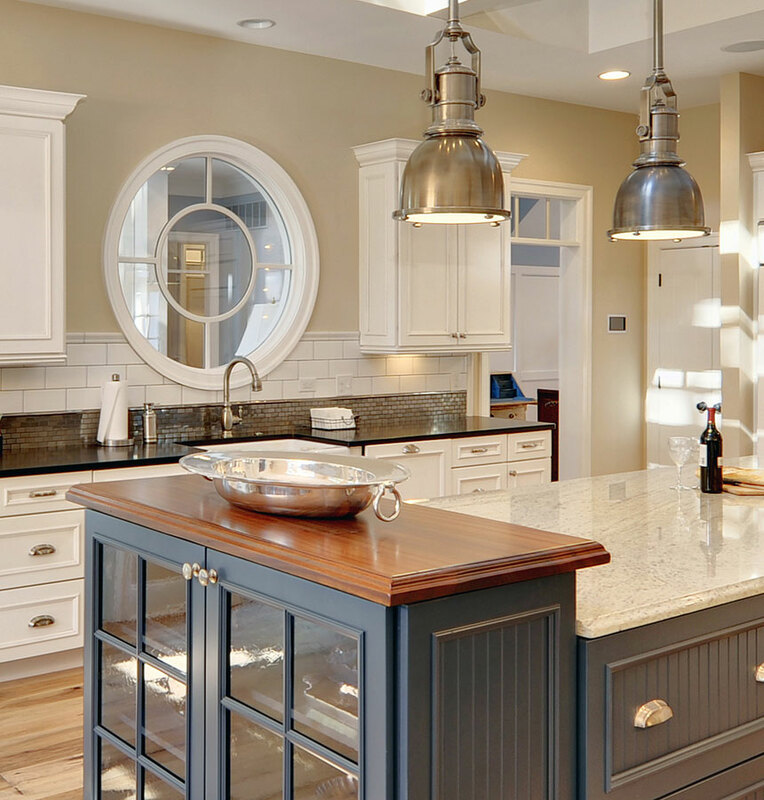 This polished design includes Plain & Fancy Cabinetry and Hafele lighting. 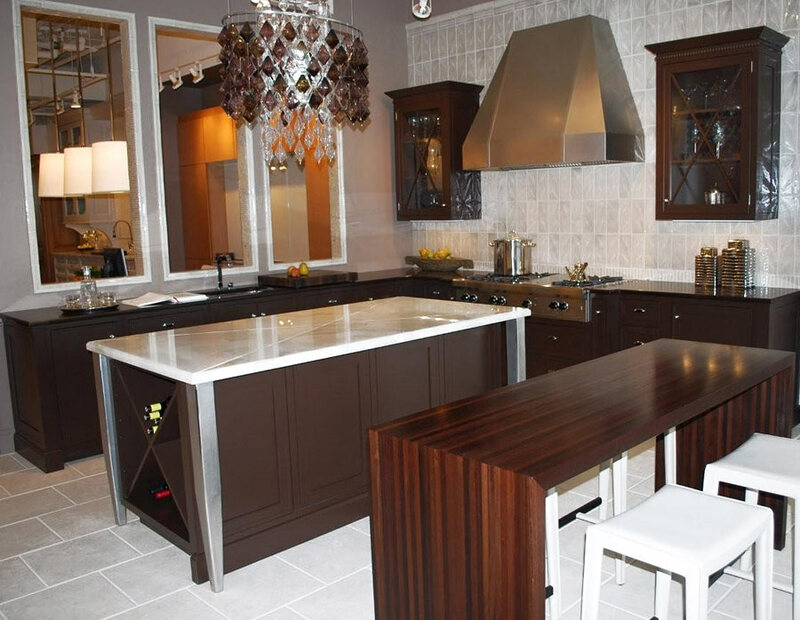 This design was on display at the National Kitchen and Bath Show in New Orleans (KBIS 2013) in the Hafele Booth. Walnut Wood Countertops with a Walnut Wood Backsplash designed by Mary Jo Peterson. Wood Countertops can go with just about any backsplash desired. 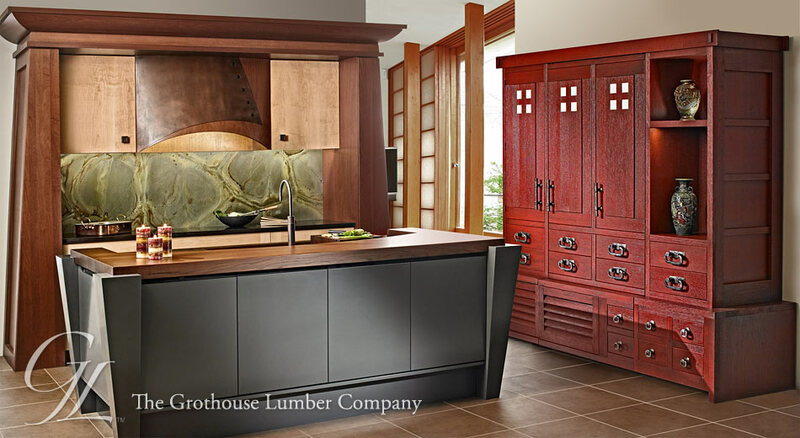 To see more designs of Wood Countertops with Backsplash visit the Grothouse Image Library. Grothouse reclaimed wood countertops continue to be a popular and distinctive element in design. While many may think of reclaimed wood as a product that is only for use in traditional designs, using it as a warm compliment to cool contemporary spaces is growing. Better yet, the reclaimed wood is a green option that makes use of the high quality old growth wood of yesteryear. At Grothouse, our reclaimed wood is primarily from dismantled 18th and 19th century Pennsylvania barns and the character of each board varies based on the original use. The structural beams, sawn into boards are old growth lumber and have minor imperfections, albeit a few nail holes where a harness hung on a nail. In contrast, old floorboards have scrapes, gouges and holes from years of traffic and hardworking farm hands. Exterior boards tell a tale of weathering, worm holes, nails and an occasional bullet hole. When discussing reclaimed wood counter top for your design, a conversation about the desired appearance is critical for a successful result. If you desire the wood to have a new appearance, select wood sawn from beams. For a distressed appearance, select worn boards from the floor or walls. Our reclaimed wood is typically Oak, Heart Pine and Chestnut. Our Durata Matte is a popular finish for its organic low luster look. Durata provides a protective and waterproof countertop finish that is maintenance free and easy to clean. Scratches can be buffed out, similar to waxing a car. In addition, stains and glazes can be added to enhance the character flaws of the boards. 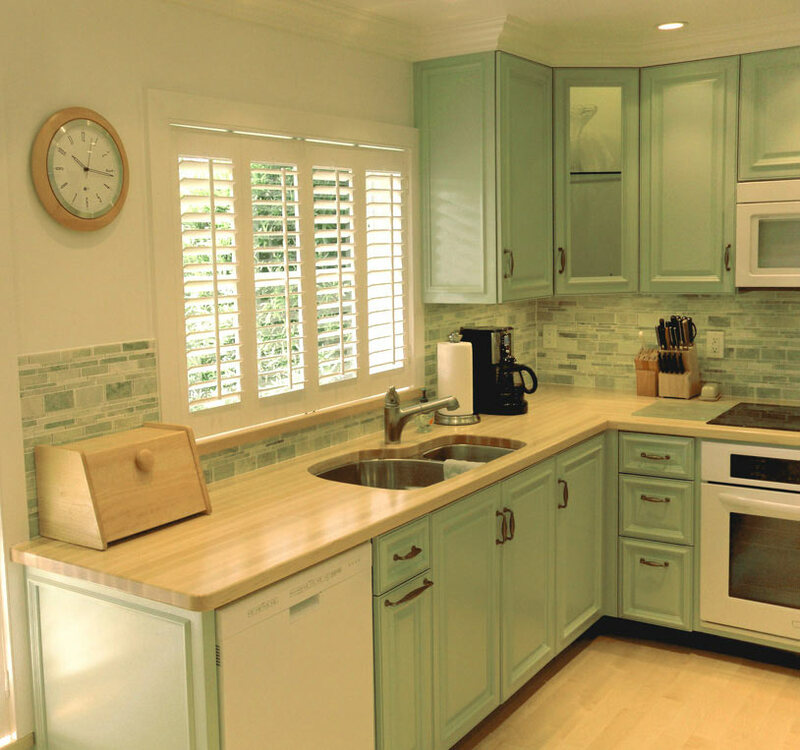 For design inspiration visit us at reclaimed wood countertops or call 877-268-5412. A stack of Antique Pennsylvania Barn Beams ready to be made into Reclaimed Wood Countertops.